Trying on a New Look black straw hat at Curtis' Grace's shop. Where do I start? Curtis Grace is friend of mine who has a shop (Curtis A. 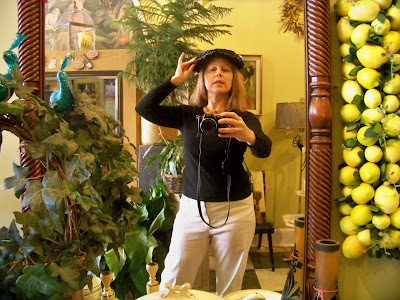 Grace Design) which those of us who love fashion -- or gardening - or antiques - or vintage toys - find like visiting Ali Baba's cave, only far prettier. 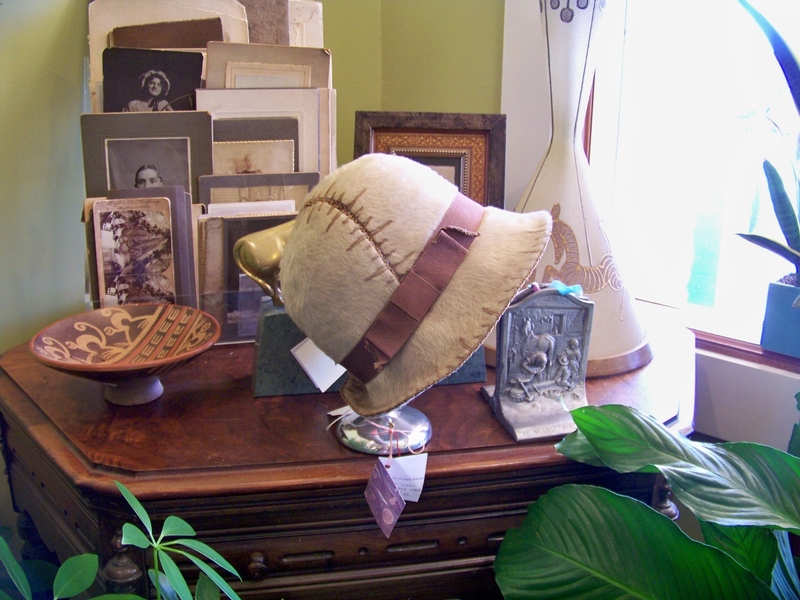 Where jewels of great price, like Schaparelli hats or Edwardian shirtwaists, or celluloid-handled butter knives, or antique ribbons, or vintage garden books, or 1940s paper dolls and their wardrobes, wait for intaken breaths, and in my case, anyhow, unquenchable squeals of excitement. Curtis models a furry (!) pancake hat. Where, whenever I enter, the air smells like fresh flowers and moss, because Curtis is a flower and party designer, along with running his shop, and I might find him conferring with a client about a Mad Hatter afternoon tea, or a knock-out, all-stops-pulled graduation party, with 5-foot high floral arrangements hung with lighted candles. Has he done parties? Oh my. Those of you who know how the Bluegrass loves a party, and Dressing Up -- think Kentucky Derby, and take it private and luxe -- will have some sense of just what he can do and has done. So, two Mondays ago, longing to be Out, after months stuck inside, my feet found their way to his shop for a morning's browse and chat. I had a sudden thought to share the morning with you. So I asked him if he'd mind, and he said, please, go ahead! So out came the camera. 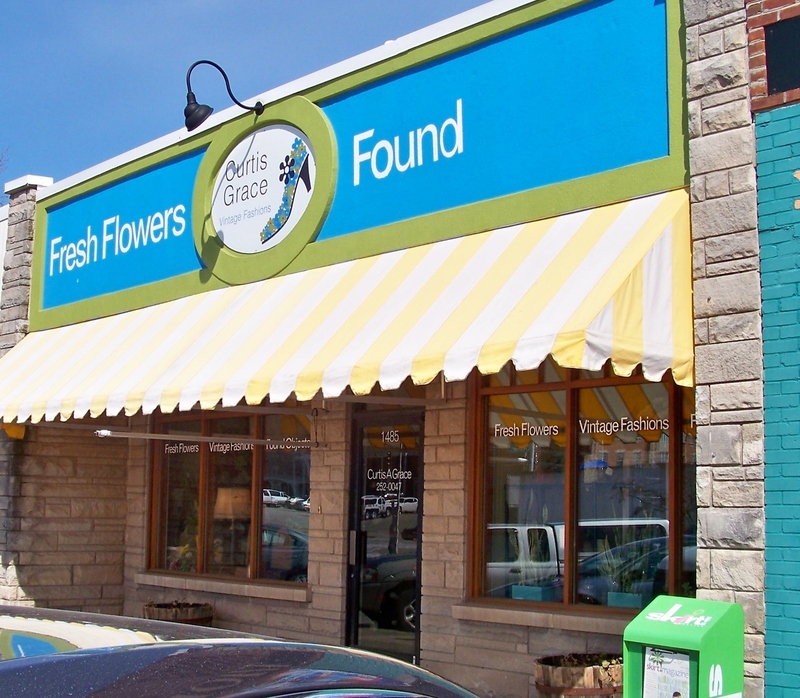 Come along with me now, and have a look at what we found! Here's a dream dress. 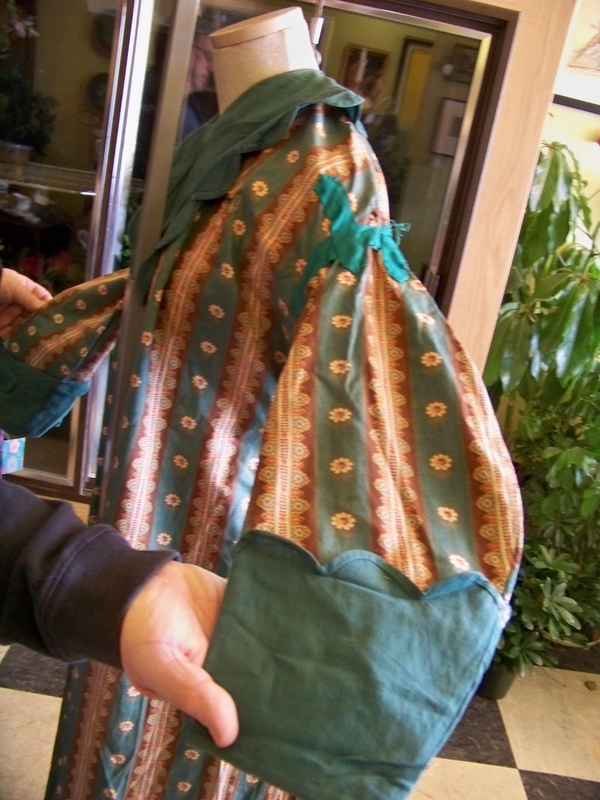 It's from the 1930s, of very light and papery sea-green silk. 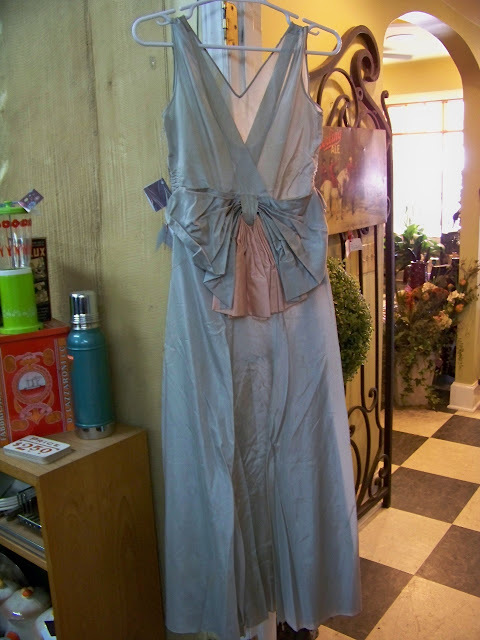 A dinner gown, I would suppose. 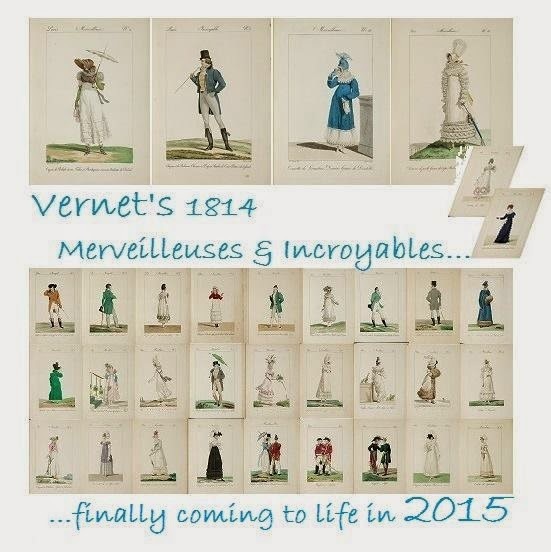 The design is exquisite, and clever. 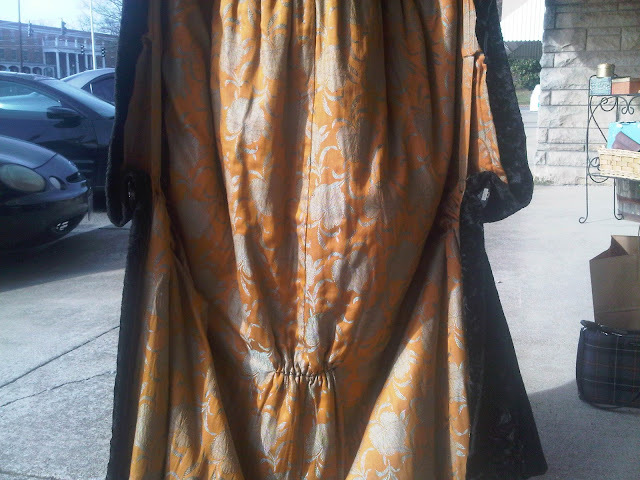 The front has vertical ruching; between them the front panel is tucked a bit allowing fabric to hang in a slight puff, at tummy height. Ick, you say, until you realize that this means your tummy is not outlined, skin tight, but just suggested. Ah, what smarts. The decolletage is not that low, but plunges in the back, and then there's that bow. That wonderful bow, both sculpurally sturdy and drooping. The dress is not lined, so one would wear a silk slip beneath. It's one of my recent favorites and were I small, it might have come home with me. Do you see how the pink part of the bow is the only contrasting color in the dress. I think that's brilliant. The skirt is somewhat full, but since it's cut on the bias, it clings, though not tightly, since the fabric is papery, not a crepe de chine. Another way that the dress helps the wearer avoid showing just a bit too much for comfort. Twenty-first century designers, the most of you could take some lessons from the construction of these older fashions. They're brilliant. Hmm. What next. 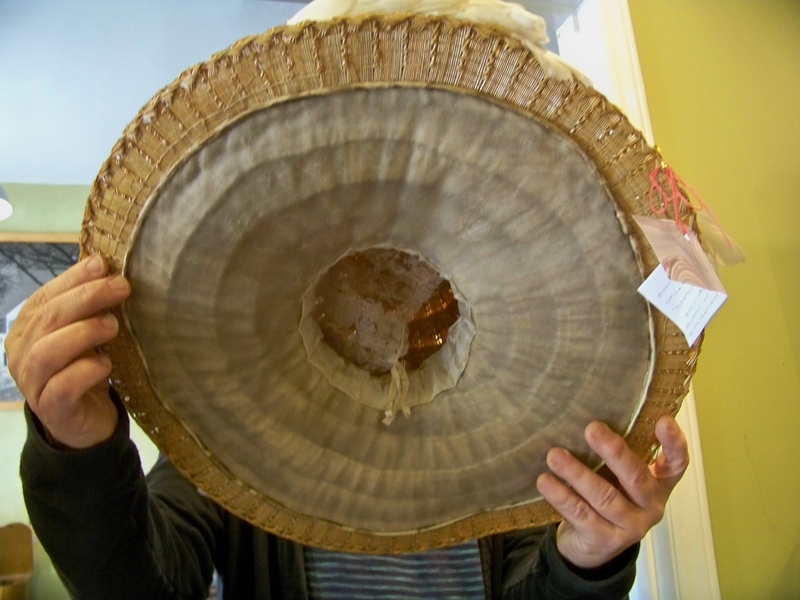 Oh, a giant Edwardian straw hat. Curtis, this picture is funny: you seem to be thinking your hat might take off any minute. 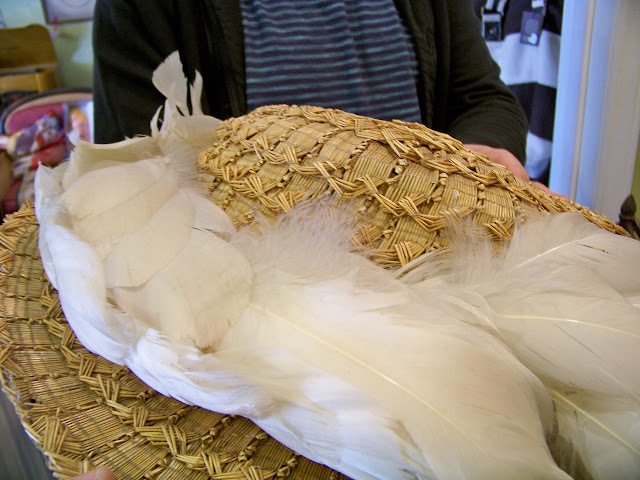 See how the rough, decorative weave of the strawe contrasts with the softness of the feathers. Then look closely at the feathers themselves. They're not fancy feathers, are they? They're just plain ones, but layered, they float and puff. 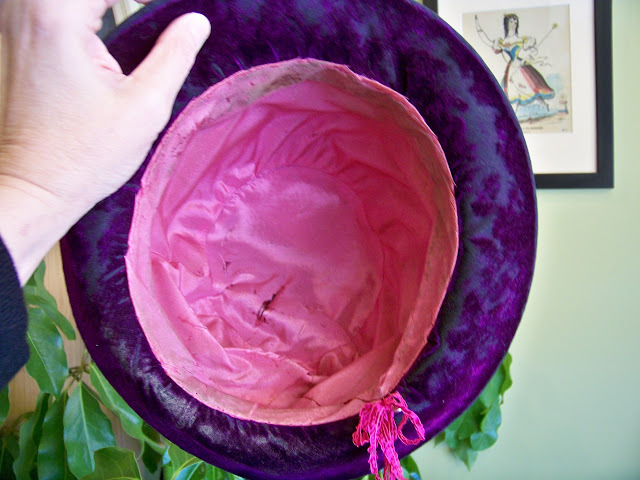 The inside of the hat is wired to strengthen it, but also to hold on the lining, which would protect the hair from catching on the straw. Perhaps the color, originally white, would keep the yellow color off the face as well. 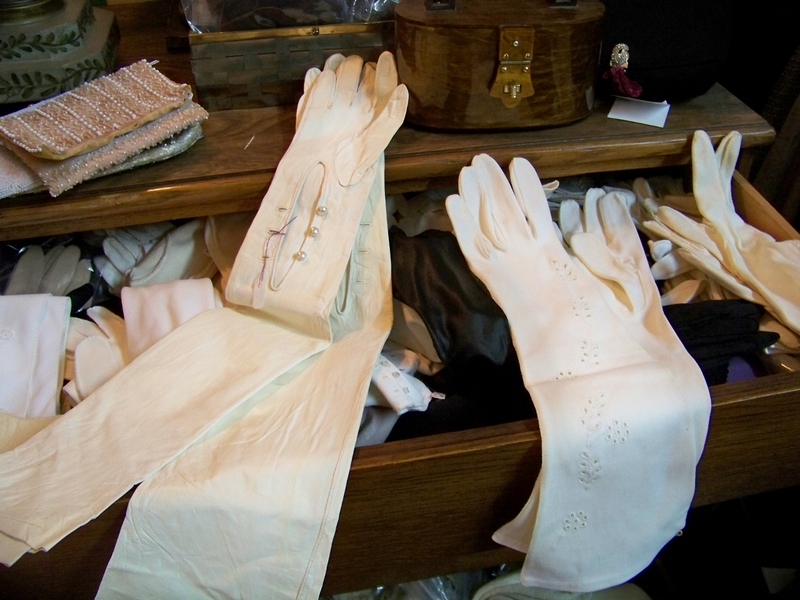 Curtis often has Victorian-era clothes in his collection, which isn't too common in shops. He sometimes finds them locally, so sometimes you can get things with provenance. How nifty is that? Remember the early 1870s brown silk I have? He found it locally. Here is a piece he's put in his shop that he's had almost since he started collecting as a teenager. 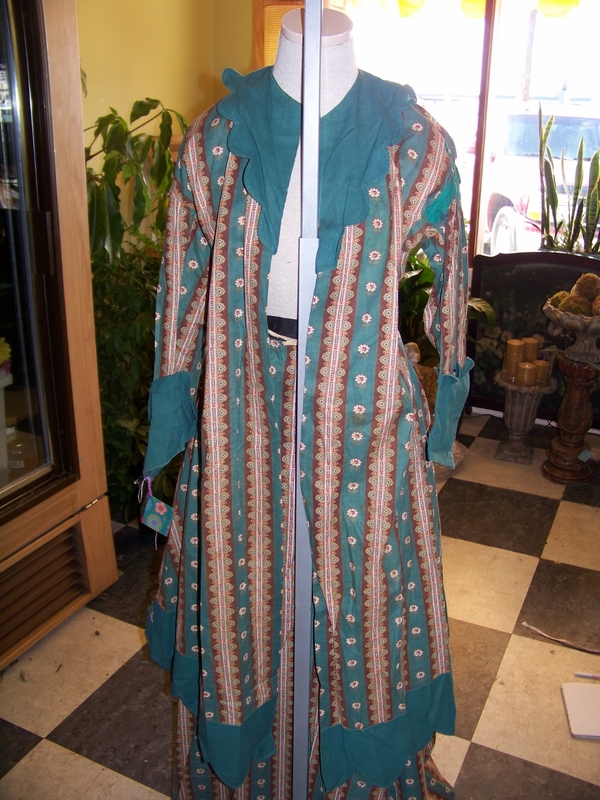 Guess what, it's an 1870s polonaise morning ensemble. 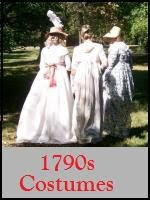 Yes, that's right...both polonaise bodice and the skirt. Eeeeeeeee! 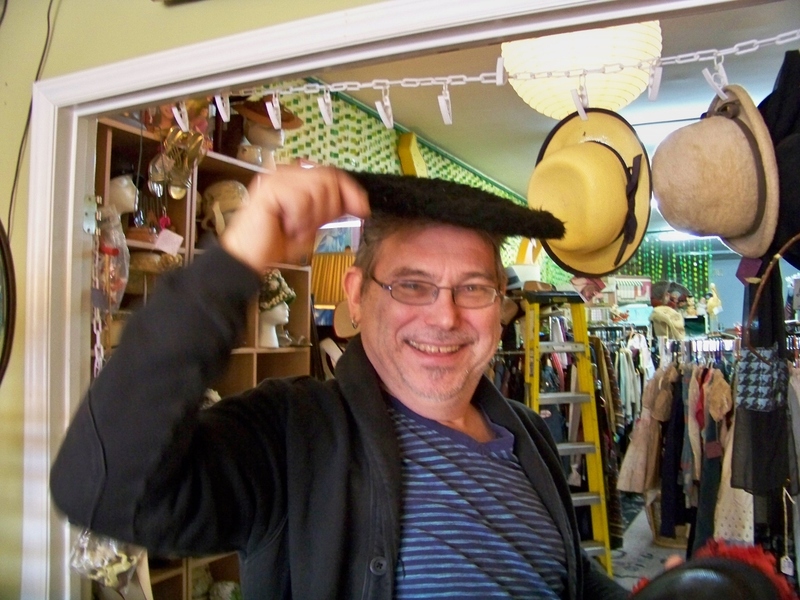 When I came in he had a big smile and said I just had to see it, so we took it to the front of the shop, and took tons of photographs, and guess what, I am measuring it! Am only partway done, because there is lots of measure, but it's fascinating how it's put together. Yes, I promise, in another post I'll put both measurements and pictures. It's rare to come across something like this. point, and none too neatly. was used for fancy dress or the theater. See how full the polonaise is! The skirt: it's very full too, and was also taken in. 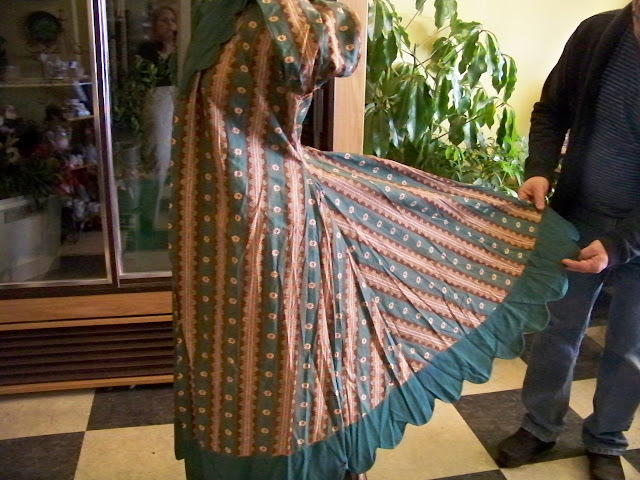 Somebody appears to have used it for the theater or a party costume, the bum: they roughly took in the skirt and the bodice, both, so the symmetry is messed up, but it's still lovely. What's so cool is how economically it was made. The fabric is just a printed cotton. It would be a quilters cotton today. It's very tightly woven. The green trims, including the bias folds, match perfectly. 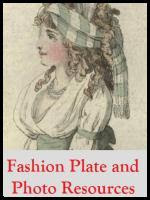 It was pretty common for manufacturers to make coordinating fabrics available, then as now. Quilting fabrics by Moda, for instance, still do. We examined the insides carefully, looking for the evidence of thread and machine to understand its construction. Curtis went to Parsons in New York, so a good part of the time when I visit I am madly learning, taking in what we talk about. It's so good to have a friend who likes to talk shop and to share ideas. 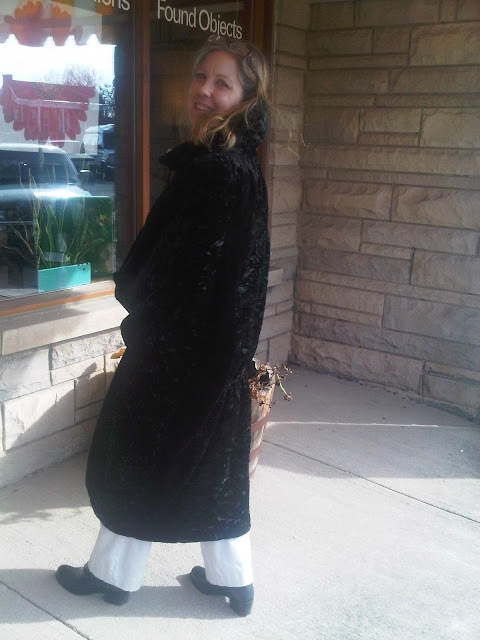 Curtis had to show me a coat, a really special coat. This is one of those 1920s cocoon coats, and it's basically mint condition. 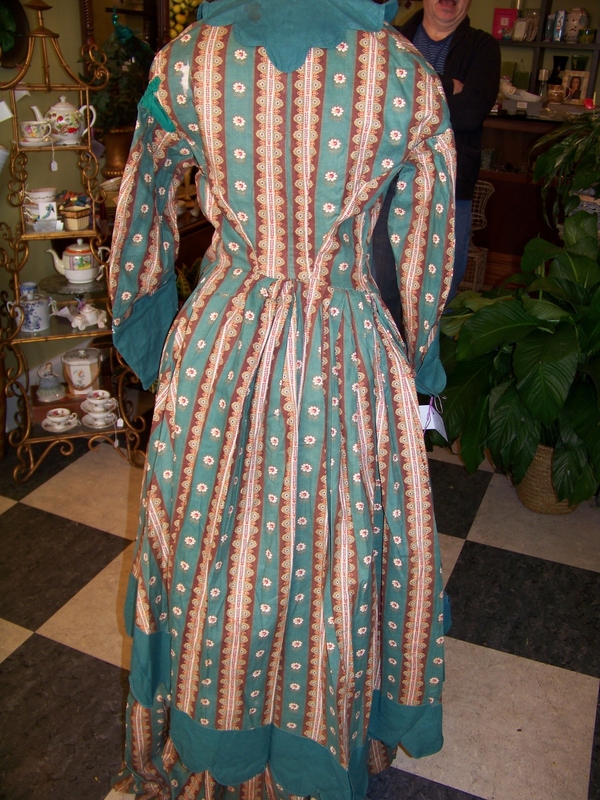 There is no other word for this garment than luscious. It was such an experience to put on. You'd think a cocoon would be, well, fattening. Oh no, not at all. It's very, very flattering. Oh, and underneath the gloves, drawers and drawers of millinery trims and lace, even black beaded glass fringe (yards and yards). Oh, and in a baby carriage, and stacked in a trunk... 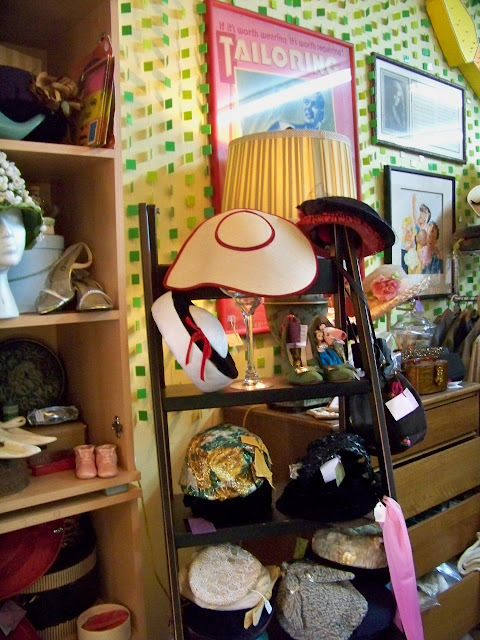 Antique, vintage, all kinds. 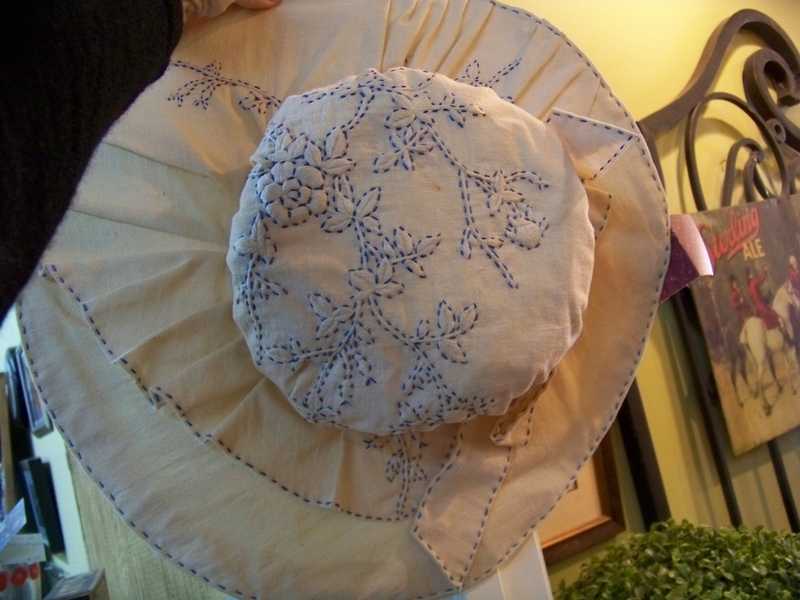 Lengths of insertion, flouncing, some of them yards long, some on the original rolls, and collars, and dress appliques, and horsehair, and feathers -- some single, some made up already into completed trims. Some could be used, I suppose, especially the lace, but most of them I prefer for study: they tend to be fragile, especially the feathers and ribbons. They are fascinating. I went through it all, as always, very methodically, so methodically that I forgot about the camera on that part. Oops. 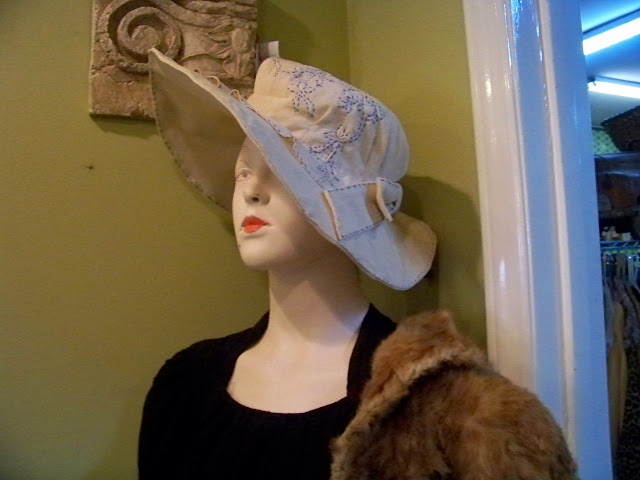 Well, at least we have this: here is the wing from a hat -- this has got to be Edwardian or 19th century. Notice how the back of the wing is padded to help it hold its shape. 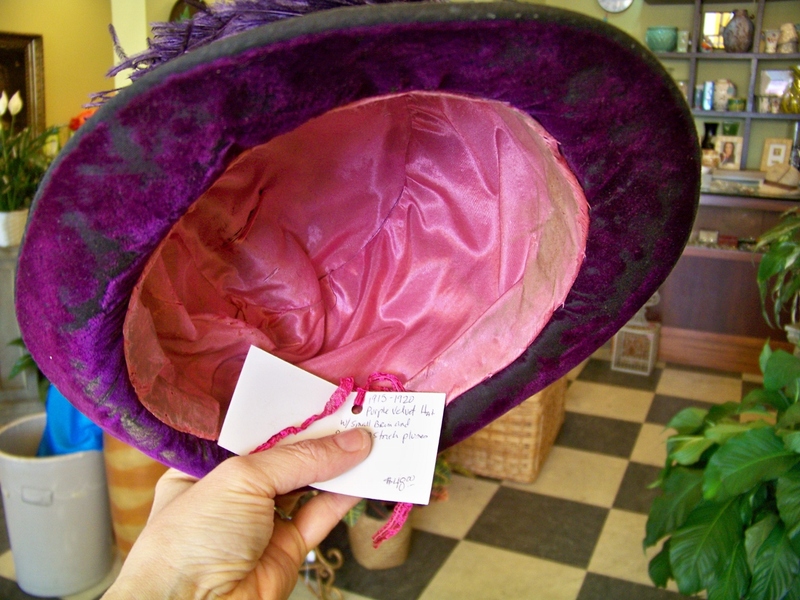 Behind my hand is a whole slew of hat veiling, and a hat with decadent satin trim, stuck with a mean hatpin. 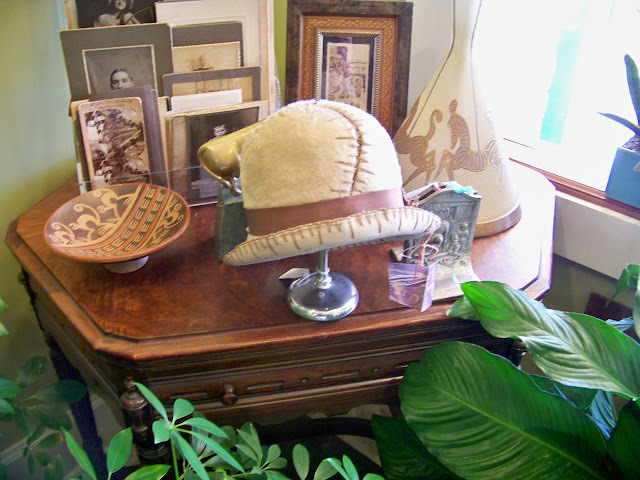 Sometimes he has great long pieces of veiling, and always the short, already finished veilings used in the 40s, 50s, and 60s. We spent a lot of time with the hats. 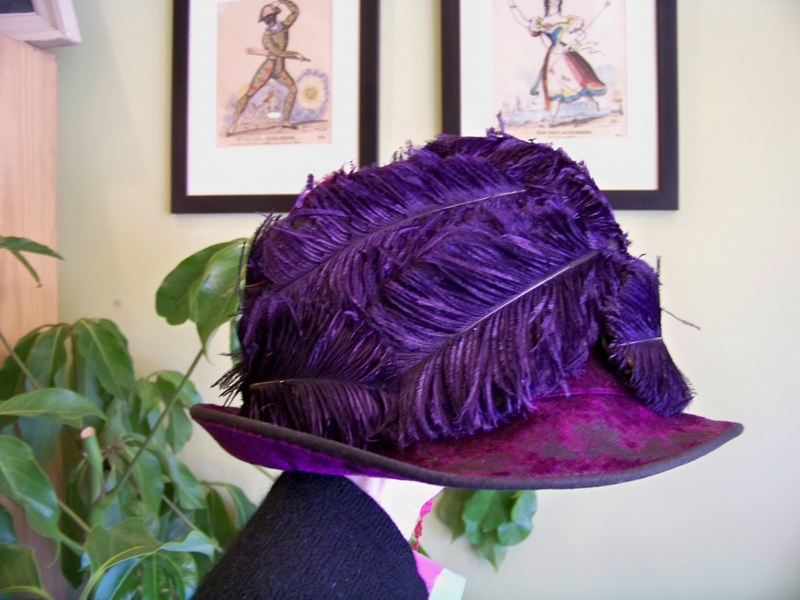 This one's a Schiaparelli; Curtis gets really good ones pretty frequently, and they usually don't stick around long, because he prices them reasonably. Okay, the fagotting on this one reminds him of a brain pan, and he has a point (thanks, dude, now I cannot get the idea out of my head), but it's a neat hat nonetheless. 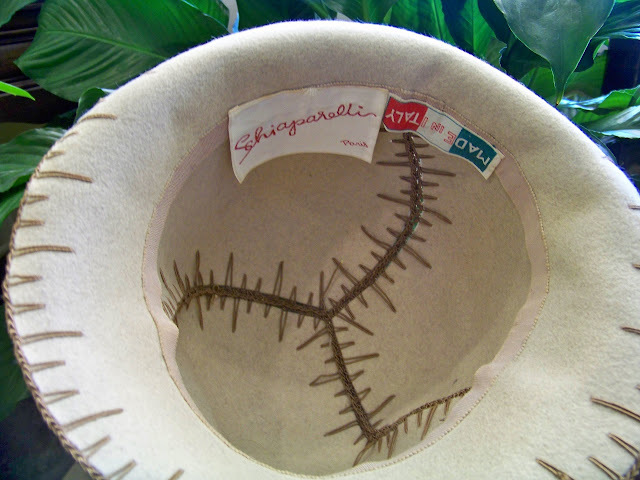 Yes, it's a Schiaparelli. Beautiful construction. I fell for this purple teens hat. It's a shame it doesn't look right on me, because it's a hummer. The velvet -- or is it velveteen -- has worn off in places, leaving the darker base, an effect I find neat. Hot pink silk interior. Whoa. Normally I don't go for purple+hot pink. Too '80s. But here? It's wow! Note...no sweat bands on these earlier hats. 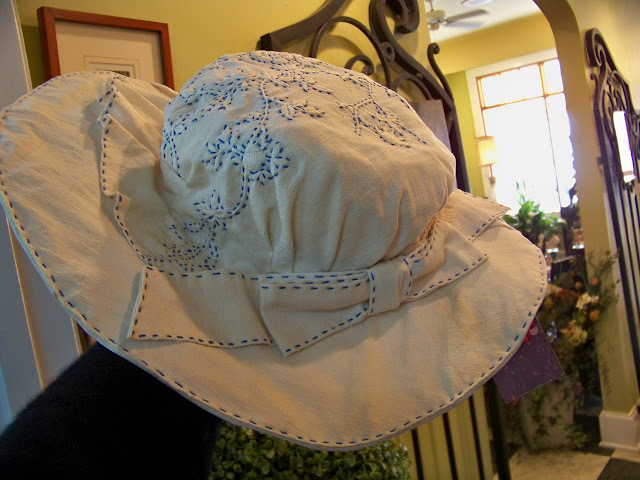 Then there's my favorite, a B. Altman fabric hat. It feels like it's lined with paper, but really it's probably a stiffish buckram. The fabric is prettily, modishly embroidered in trapunto, and the whole ornamented with an elegant self bow. We played with tons more hats, and when my friend Polly and I returned this past weekend, she bought the cream straw trimmed with red. It's in mint condition and is fantastic on her. 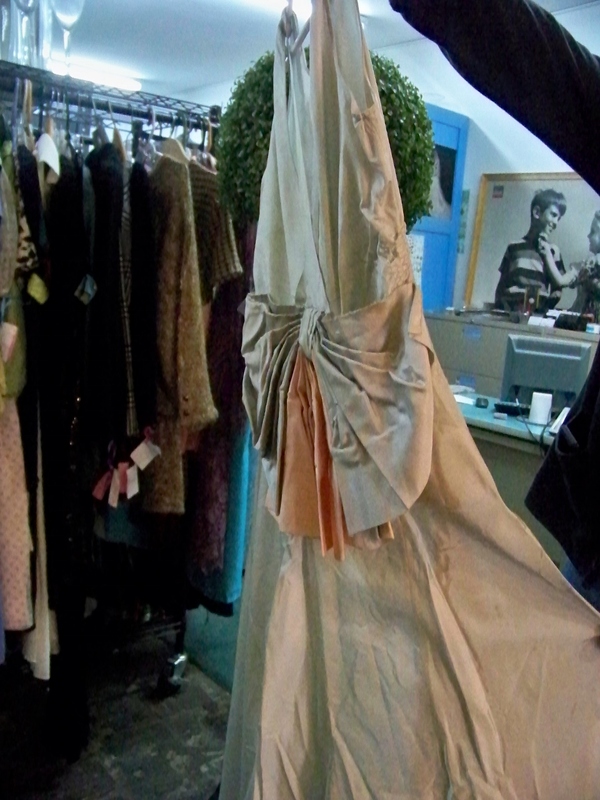 "Paging" through the racks, Curtis picked out another unusual dress to show me. 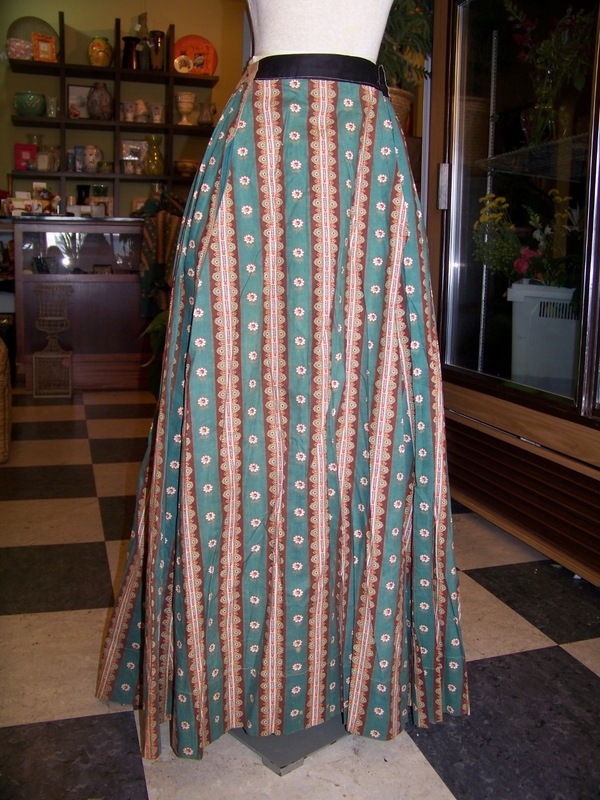 This '20s dress wraps, but we can't seem to find any front closure anywhere. It's in organdy, I think, still with a bit of stiffness, and all the seams are French. That's not piping at the waist, it's bias tape. Odd, but it works. 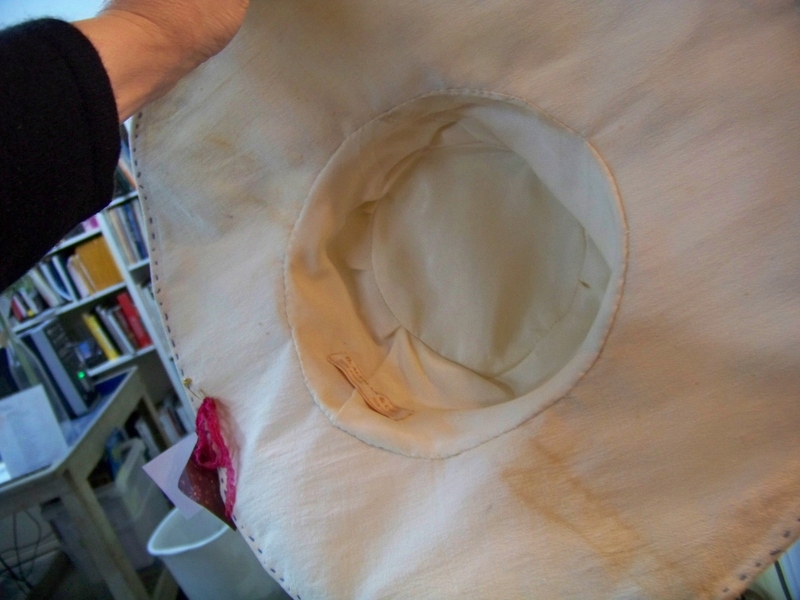 Probably a home job: look at the rough gathering on the interior, and that bias tape. Yet once again, it works. 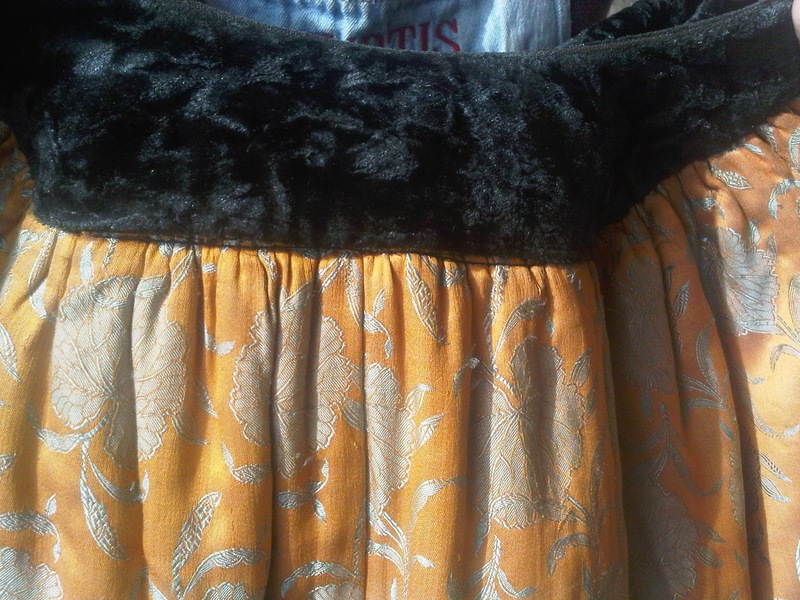 An example of the French seams, and the dress' hem. 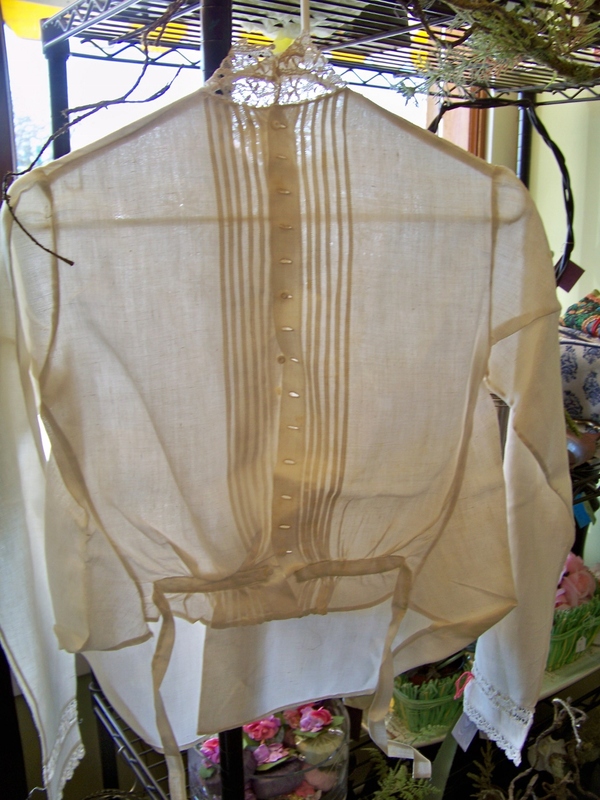 As always, I checked the Edwardian whites rack. This shirtwaist caught me and so I walked it to the windows at the front of the shop, because it has the starch that it was last pressed with. Curtis didn't press it and I don't think the previous owner did, so, that's old starch? 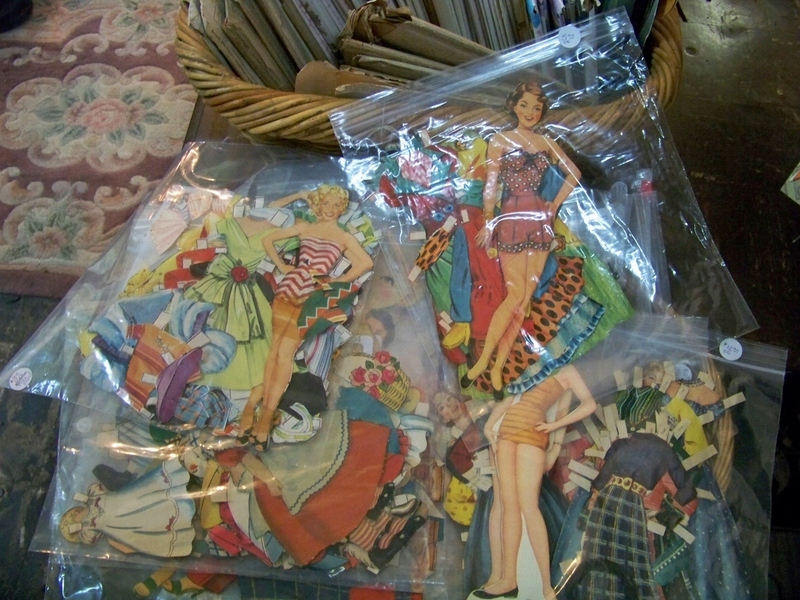 Lastly, I sorted through, for a few minutes, the paper dolls. There are old ones, from the teens, for example, but many more are of the eras you see below...the 30s-50s. The models are so neat to look at, sweet, while at the same time, we might find their underthings a wee racy for little ones? And their clothes. Just neat. 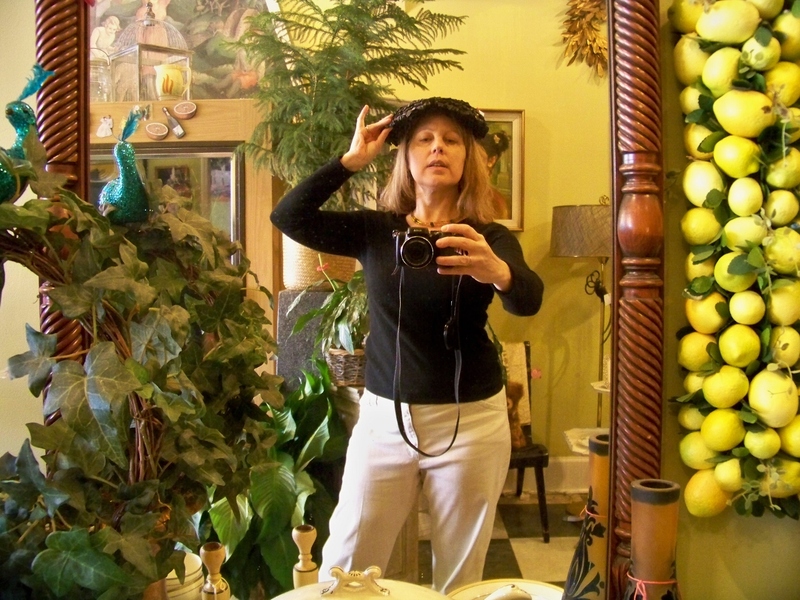 Nuts, you didn't see the '50s shirtwaists or '60s wool skirts, or the mint-condition red "That Girl" hat that actually suited me (a rarity with hats), the butter knives, or the bone china tea cups, or the 1920s fine chia set, or the old advertising signs, or the photos, or books, or mens' things... It would've been too long a post anyway, I comfort myself. So that was my morning. What fun, to chat, to peek, to sort, to try on, to ooh and ah, and to find a little something to bring home. Antique ribbons....I totally fall for those. One last picture: here's his shop: don't you love the front? Chic, not overdone. He's here in Lexington, KY. If you're in town, do visit if you get a chance. He's on Etsy, too, under curtisalad, but doesn't have anything listed right now. Curtis, please list!! 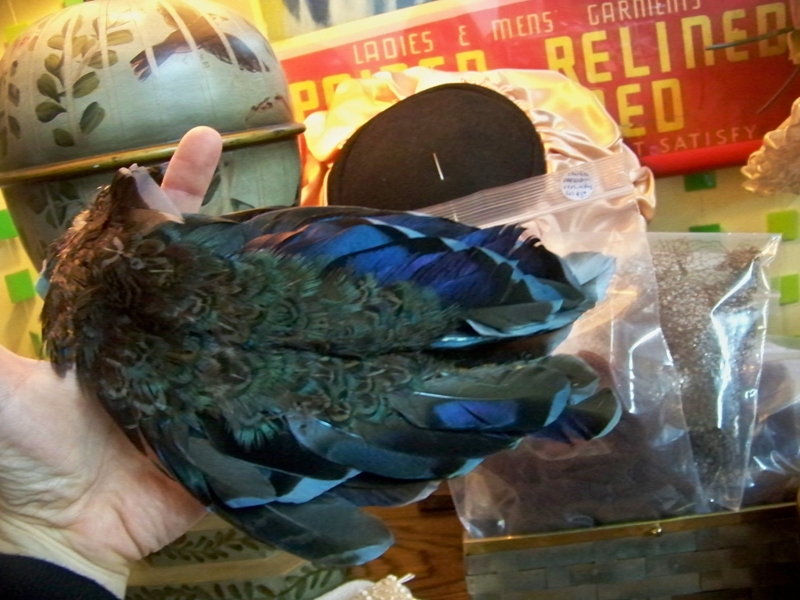 You're right: the shop is a wonderland, and Curtis is an expert at hunting; people often bring things to him, too. Thank you for taking us to the shop, I loved it!